Sample tweet: "Starting a duvet band. More sophisticated than a cover band, plus we can charge a lot more." 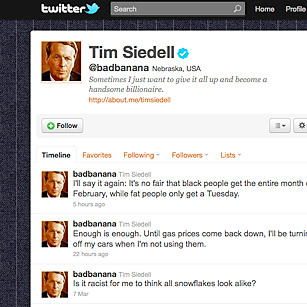 Tim Siedell is an advertising creative director, blogger and writer living and tweeting in Nebraska. He has nearly half a million followers, which is completely understandable, since his Twitter feed is one of the funniest we've ever read. O.K., we know Hosni Murabak and Sarah Palin jokes are a dime a dozen on Twitter, but @badbanana's mix of deadpan comedy and sardonic observations stand out in the Twitterverse  no easy feat  making him worth the follow.